Which camera did I decide to take to Saratoga Springs? (It's not November yet!). Also a Zach Theatre Photo Link. Made me hungry by the end of the hour long workout so I indulged in a guilty pleasure: Jason's Deli makes a Tuna Muffaletta. They call it a Tuna-Letta. It's on the same crunchy bun but instead of the usual, New Orleans inspired, ham, cheese and tapenade it's stuff with tuna, hardboiled eggs, spinach and, well, an olive tapenade. I think it's delicious. Big sandwich, chips, sparkling water and a free ice cream for a whopping $6.81. Then I got on to my important job for the day --- deciding which camera and lens to drag along with me to go visit the younger Mr. Tuck in Saratoga Springs. 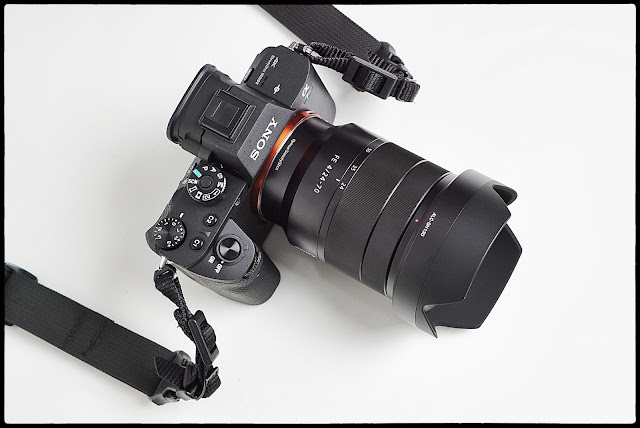 I leaned heavily towards the original Sony a6000 for its "uncluttered-ness" along with the Sigma 30mm DN for its "damn that thing is sharp!-ness" But in the end I think I've decided to take the Sony A7ii and the Zeiss 24-70mm f4.0 with me instead. I like the lens range, the light weight of the lens and the old school look and feel of the body. When I visit colleges it always takes me back on the nostalgia express to the time when I first got interested in taking pictures. The A7ii is really my only pure nostalgia camera these days just because it is frankly uninteresting and not remarkable. This way, if I get a good photograph over the weekend my family and friends might be more inclined to give me some credit instead of chalking it up to some idea of the "magical" camera that can do no schlock.